question asked: Aug 26 '13, 3:30 a.m.
last updated: Apr 15, 11:41 p.m.
how to get RQMUrlUtility get working even for urls not having port number? RQM Server user credentials of RQM 3.0.1? How long do repotools -rebuildIndices take to run? yuvaraj patil (33●6●8) | asked Aug 26 '13, 3:30 a.m. 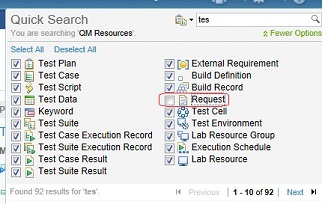 The error does not occur if the 'Request' field among the list of options is unchecked. Uncheck the box "Request" - the error disappear and the search runs fine. The issue is not project, user or machine specific. What is causing this error message to occur? Is there a way that the 'Request' checkbox is always set to unchecked? Krzysztof Kaźmierczyk (7.2k●3●43●86) | answered Aug 26 '13, 4:18 a.m.
Let us know if after running this command the error disappears. yuvaraj patil commented Sep 20 '13, 3:17 a.m. Thank you Krzysztof, it worked!! Michael Angelastro commented Apr 15, 11:41 p.m. This worked for me as well! We have a large project in our QM instance so it took almost 5 hours to run. Vijayveer Reddy (17●12) | answered Jan 28 '16, 3:45 a.m. Thanks Krzysztof, its worked for me also..